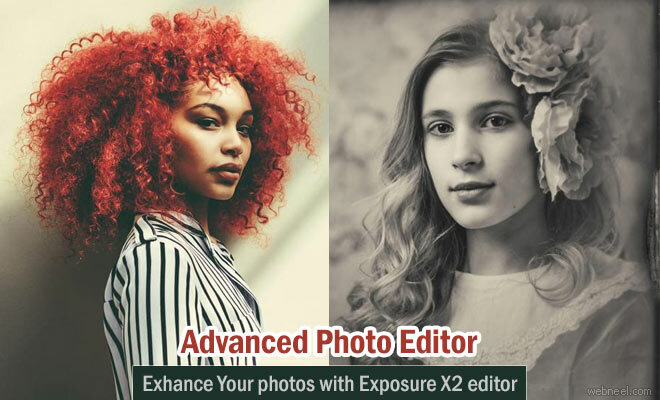 Photo editing apps : Exposure X2 is an advanced creative photo editor and organizer that improves every step in your editing workflow. Use it to quickly organize your images, non-destructively edit your photos, and apply gorgeous looks and special effects. Exposure has been acting as a creative photo editor for digital photographers seeking a smarter, faster way to work. And Exposure X2 is an advanced version which continues this tradition. It helps in organising your photos in an efficient way and thus transforming them into beautiful art works. It can be used as a total solution for RAW editing or as a creative editing plug-in with Adobe Lightroom or photoshop. The Exposure Bundle features natural media tools, so you can transform your photos into realistic oil paintings, watercolors, and more.Exposure has the tools you need to create your masterpiece. It gives chance for creative editing zone which is streamlined and intuitive, where you can avoid steps like catalogs or imports.Exposure is flexible enough to handle any photography workflow. It supports a variety of file types (RAW, DNG, JPEG, TIFF, PSD), DSLR and mirror-less cameras, and lenses. Over 500 presets emulate the most iconic analog films, ranging from vintage Daguerreotype to modern portrait films like Kodak Portra. Additional presets like lo-fi, faded, and cross processing go beyond film presets, and offer a tasteful blend of effects. You can customize each one, then add it to your library of looks. Exposure X2 is available now for $149 for new customers, and $100 for existing Exposure X owners. The Exposure X2 Bundle is higher at $199 for new customers, or $119 for existing customers who need the upgrade.